Autumn has come with a vengeance and Miss Sheri has been busy all week dealing with dead leaves that have been carpeting our lawn. Thankfully she has a big tractor otherwise we'd need a lot of really good rakes. We drove down to Iowa this weekend for a visit to the farm. The weather ended up being beautiful so we spent a lot of time outside. I brought my drone down for the first time so had some fun walking around getting photos in different places. There's a lot of freedom to fly it here with not many obstacles. Blue loves coming to the farm. So many interesting things to smell, although we have to be sure to watch him to make sure he isn't eating anything he isn't supposed to be eating. There's some nasty stuff lying around and that's what he's drawn to more than anything. The nastier the better. It's fun to wander through the fields where there isn't a soul around for miles. It's a pretty peaceful feeling. I'm definitely coming here when the zombie apocalypse starts. Miss Sheri and I went for a ride on the 4 wheeler and rustled up this owl. He wasn't very willing to pose for pictures even though we chased him for quite awhile. I kept thinking he might decide to be more friendly with us, but he just kept flying away every time we'd get close. One of these days I'm going to meet a nice owl. The reason for our visit to the farm was to attend the Confirmation ceremony for our niece, Karli. It was a beautiful service in an incredible church. We were very happy to be part of the celebration. We had a lot of fun spending a couple of nights with Miss Sheri's side of the family. Unfortunately the boys weren't able to join us this trip, but we had enough fun for the four of us. We don't get to see her mom and brother as much as we'd like, so we make sure we fit in as much enjoyment as we can while we are together. Blue discovered on this trip that he likes to put his head outside the window while we are driving. For some reason he's never shown much interest in doing this before, but maybe there was something interested he smelled this time. I'm sure it was something nasty. My job as an enterprise salesperson at Oracle has given me the opportunity to travel quite a bit lately. I caught this shot of Minneapolis while flying by this week and thought it was pretty cool. This week I had the chance to spend a couple of nights in lovely Omaha, Nebraska. The weather was beautiful while I was there and the people I met were very friendly. A couple of important things for me to have a good time while on the road. Krazy Kory also covers Omaha for his job and we had the opportunity to have dinner together. I always enjoy seeing Krazy Kory. We bumped into the Main Sisters while we were out and about. I found out that there were another 2 sisters who couldn't make it out that night, but it was quite the pleasure getting to meet these 6. On Friday night, we had the good fortune to spend the night on the town with our friends, Jen and Dan Walters. I saw some pictures of Dan from several years ago where he was wearing a Kangol and I complimented him on his good taste. So Jen and Dan surprised us with some new head-wear for us to enjoy on our special night. Needless to say I was thrilled with the fashion statement we were making. Our destination was the home opener of the Minnesota Timberwolves. They were taking on the Cleveland Cavaliers and we were excited to go down to the Target Center and cheer on the local team. Jen and Dan had never been to an NBA game before. Dan was absolutely tickled pink when he was invited to the administration office so he could receive a certificate for attending his first game. I'm sure he'll get that framed and hang it somewhere special. There's been a lot of drama around the Wolves to start the season as one of their best players, Jimmy Butler, has decided he doesn't like to play with us any more and demanded to be traded. He was crying for much of the game because fans were booing him. We were able to catch this shot of him when the taunts were especially loud. It was kind of ironic that we were playing against Kevin Love who was another one of our superstar players who decided he didn't like playing here any more and demanded to be traded to the Cavaliers. He was probably pretty excited when that happened and Lebron James was on the team. I'm not sure it's as much fun now that Lebron is a Laker. I don't know why these players hate Minnesota so much. We think it's a really nice place to live. The rumor is that Jimmy Butler thinks our young stars like Andrew Wiggens don't put enough effort into honing their craft and he wants to play on a team where all the players put in the same level of effort he does. I guess I can understand that feeling, but wonder why he can't be the kind of leader who inspires his teammates to want to work harder like he does? It just seems like leaving isn't the right solution, but what do I know? At least they were able to put their differences behind them on Friday night as the team rallied together to beat the Cavs by a score of 131 - 123. Maybe that will help Jimmy want to stay with us. We really liked the half time act where the nice lady rides around on a unicycle while flipping bowls on to her head with her foot. We've seen her do it before, but it's still impressive nonetheless. I just have no clue how someone figures out they have a skill like this. Do you just sit at a table one day with a bunch of bowls and notice a unicycle laying nearby when the light-bulb goes off? I keep thinking I'm not going to post our albino squirrels for awhile and then get a better picture than the week before. This week, we had the two come into our yard and line-up more closely so I could get a better shot of them together. They're good little nut collectors. We had to do some work on the boat trailer this week so I was out on the lake by my lonesome when I saw this guy fly by me. The air temperature was probably in the forties and the water was probably in the low fifties so I can appreciate it being too cold to keep your feet in there. I just haven't ever seen someone ride a jet ski with a jacket and stocking cap before. I think this can be classified as an "Only in Minnesota" thing. 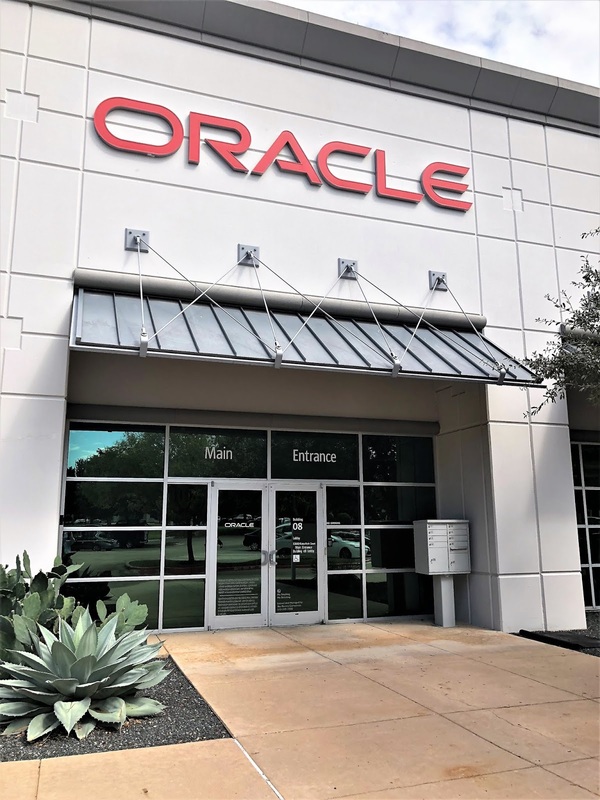 I was down in Austin, Texas this week for another Oracle training. We didn't get to go to the mega campus this time, but it was fun getting to see our buildings in Riata Park. I had the joy of spending a couple of days with my awesome co-workers, Kristi and Kristen. They're a fun couple of ladies to go through training with together. We ate at a Tex-Mex restaurant called Cyclone Anaya's where they make the guacamole right at your table. So much better than the restaurants where they make your guacamole for you in the bathroom. Every week I keep saying it's going to be the last week I post about our albino squirrels for awhile and then something even cooler happens. This week, we've had two different albino squirrels in our yard at the same time! We've been trying to get photos of them together, but they're notoriously difficult to get to pose for us. This is the closest I was able to capture them together. 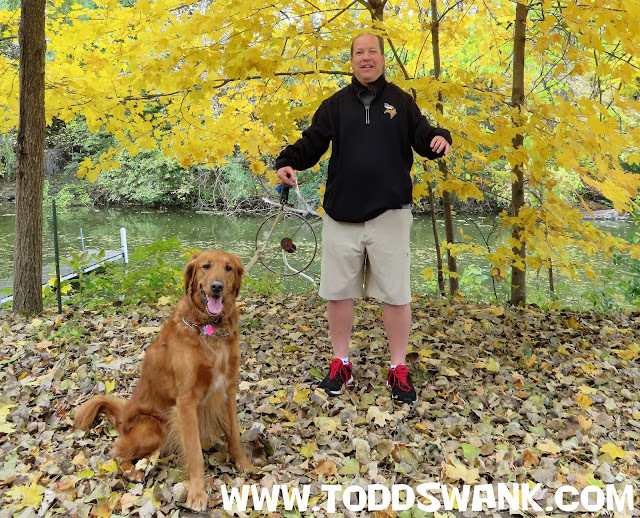 On Saturday, we headed to Mankato for Minnesota State's family weekend. Our son, Luke, is a sophomore there so we went down to embarrass him a bit. At least he says I embarrass him. I have no idea why he thinks that. The student union has a bowling alley, so we went down and played a couple of games. The competition was pretty intense, but I still lost by a lot. While we were there, some of Luke's friends stopped by to give him a pumpkin for Halloween which I thought was so nice. We're glad to see he's hanging out with such good people. We went to watch Minnesota State's hockey team take on Boston University. Minnesota State's hockey team plays Division 1 in the NCAA and they have a pretty good history of being a competitive program. They have a bunch of former players who went on to play in the NHL and many of them have places of honor in the arena. We were excited for the game to begin. When I saw the cheerleaders come out on the ice, I realized that I haven't been to a lot of college hockey games. It seemed pretty cold to be out there skating around in short skirts, but what the heck do I know! They all seemed to be pretty talented skaters so I'm guessing they've done this before. The match ended up being pretty competitive so we had a lot of fun cheering on the home team. Minnesota State started off with a 3-0 lead, but Boston University came back to tie it up in the second period. At that point, the home team went on to score two more times to bring us to a final score of 5-3 and the victory. Good times!